Welcome to the T3 best gaming chairs for 2019 guide, a resource packed with solid advice and top recommendations for your next gaming chair purchase. Here at T3 we are huge gamers (both PC and console) and, as such, we know a top-rate gaming chair when we see one. This grants us the expertise to make sure the next chair you buy isn't just well-rated but, even more importantly, is the absolute best gaming chair for you and your intended usage scenarios. Whether you're a PC or a console gamer, upgrading your gaming chair or investing in your first one to help raise your game and comfort level, this best gaming chair guide should have something to offer you, as we've aimed to include chairs for every budget, style and specialism. Crucially, though, while this guide is an authoritative source of gaming chair information, we would say it is imperative that you do you research thoroughly before pulling the trigger on an upgrade, so be sure to read up on each chair you're interested in both here and on the manufacturer's own website. After all, picking out the best gaming chair makes a big difference to the quality of your gaming, just like your choice of monitor and input devices. So this isn't something to take lightly or you could end up with seat that lets you down in a key area that effects your comfort or game. Getting the right gaming chair means you've got a better chance of hitting those enemy targets or those high scores you've been chasing, and that makes it a no-brainer to only pick up the absolute best gaming chair for you. Read on to discover the greatest gaming chairs of 2019. When buying a gaming chair, look out for the differing levels of comfort and support included, like the ability to make adjustments to height, arm rests, and the way the chair reclines too. Detachable cushions are a bonus too. You should also find out what discipline or gaming genre the chair might have been tailored for, if any – some of the best gaming chairs on the market have been designed with racing or flight simulations in mind, for example, though there are plenty of general, all-round gaming chairs available too. What's the best gaming chair? Naturally, you should also consider the look and style you're going for when choosing one the best gaming chairs currently available in 2019. Fortunately, most gaming chairs are suitably stylish and tend to resemble leather-clad racing car seats, but you'll obviously want to pick a style that goes the best with your gaming room decor, as well as a colour that won't annoy you or your partner hours into a gaming marathon. It's also absolutely crucial when buying a gaming chair that you pick one up from a premium, respected maker that has proper heritage – or a new brand that comes well recommended by others. With a lot of new entrants in the market just lately, the waters are now well and truly muddied, making it hard for the uninitiated to tell if a gaming chair has the build quality to go the distance. The Nitro Concepts S300 is one of the best gaming chairs on the market today, offering great comfort and features at an attractive price point. Ideal for long gaming sessions, the S300 from Nitro Concepts gaming chair is fitted with top-of-the-range materials and tech to keep you comfy for hours. It’s got a built-in kind of adjustment technology that combines great design, luxury materials and ergonomics to ensure you feel supported and comfortable. One of the things we love the most about Nitro Concepts chairs is they come in a huge range of great-looking colours. You can get your hands on an S300 in yellow, green, blue, orange, red, white and black. Overall, for the price point, we think this is the best gaming chair on the market right now in 2019, providing you don't need a genre-specific unit. It's got a lot going for it, that's for sure. If you need serious back support then the GT Omega Pro Racing Gaming Chair is an excellent choice. One of the most affordable and best gaming chairs on the list, yet also one of the best-looking, too, the Pro Racing chair from GT Omega is designed with ultimate support in mind. The back of the chair hugs your back, there's a cushion for lumbar support, and the shoulder support minimises the chance of aches and pains after a day of gaming. Like most of the chairs in this guide it has a built-in reclining system, which can tilt back to 85 to 160 degrees, as well as position adjusting for quick naps and height adjusting too. This multi-purpose chair would work in an office, but its focus on comfort makes it ideal for gaming. If you are a racing game fanatic then the EWIN Europe Flash XL is top gaming chair choice. If you want a gaming chair that looks more like a high-end racing car seat than a stuffy office chair, then the Flash XL from Ewin is your best bet. It's an ergonomic design built for maximum comfort, with a durable frame, pillows for neck and lumbar support, high density memory foam and tilt-tension control. When you're shopping for the best gaming chair of 2019, you want to know it's going to be a pleasure to sit in, and the Flash XL ticks all the boxes. The Flash XL is one of the best on the list for making armrest adjustments, too, with so-called '4D armrests' that can be fine-tuned in all directions before holding them in place. It comes in bright blue and black or bright red and blue, ideal for those who are after a colourful chair that packs a punch. If you want a leather look but can't or don't want to stretch to a more expensive real leather option, then the PU leather Secretlab Omega is definitely worth a look. The Omega gaming chair is made from PU leather, which makes it a little more affordable than other options, but just as durable, flexible and waterproof. It provides great cushioning and support with cold-cure foam underneath the top layer and comes with velour pillow for extra softness. Style-wise it manages to straddle the line between a racing car chair that looks like it's designed solely for gamers, and an executive office chair. It comes in black, white, orange and blue, but these colours are accent colours, so even the brighter shades look subtle. If you want a real leather gaming chair, you basically can't do better than the Noblechairs Epic. The Epic series gaming chair from Noblechairs is all about combining luxurious leather, best-in-class quality and a classic style reminiscent of high-end racing car seats. It's an easy pick for one of the best gaming chairs of 2019. This leather-clad beauty is easy to set up and has a high-density cold foam upholstery for maximum comfort. But be warned, it's one of the bigger chairs in our list, so it won’t do for tight spaces. The Nitro Concepts C80 gaming chair delivers serious value for money. The Nitro Concepts C80 is one of the most affordable gaming chairs in this guide as it's made from a PU leather cover inspired by racing car seats. The chair is crafted from moulded cold foam rather than foam scraps, which are found in cheaper chairs and are generally not as comfortable. And thanks to some subtle design choices, it’s a good option for those who want a gaming chair that also wouldn't look out of place in an office. This is a high-end gaming chair from GT Omega that combines luxury comfort with a high-performance to rival most of the other chairs on the list. The chair is part of the XL series because it's suitable for larger and heavier users, but doesn’t scrimp on support and style. The GT Omega boasts some of the best lumbar support going, too, with a back hugging style as well as headrest and shoulder support with additional cushions. All aspects of the chair are adjustable, including the height, positioning and armrest. Given all that support and flexibility, it's a definitely pick for our list of the best gaming chairs of 2019. If you thought the Titan from SecretLab was premium, you haven’t seen anything yet. Welcome to the world of ultra premium upholstery, courtesy of the Titan Napa’s biggest selling point – napa leather. Usually found in sports cars and boutique bags, this super soft material makes sitting in the chair the closest you'll ever get to gaming in a bubble bath lined with silk. You can recline the chair so far back it almost turns into a bed, so whether you're streaming on Twitch or just having a quiet night in with your favourite new game, it's one of the comfiest and best gaming chairs you can buy in 2019... even if it will set you back £700. A step up from the Epic series of gaming chairs, comes the Icon from Noblechairs. 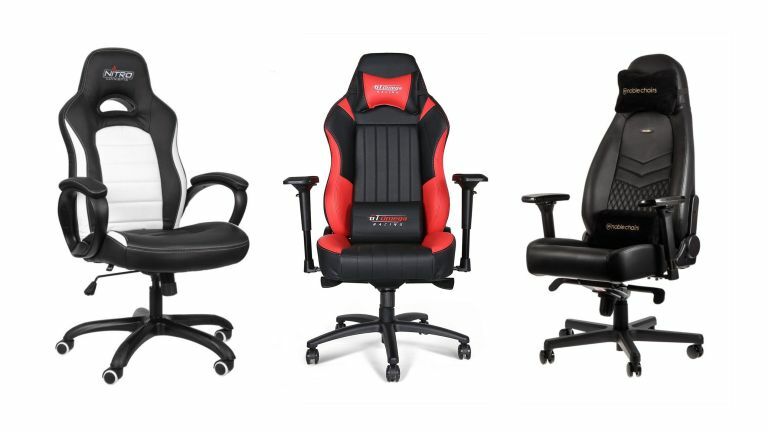 The Icon's quality construction and leather surface makes it similar to the Epic, but it’s a much more understated design that looks like fancy office chair rather than racing seat, making it ideal for those who need to maintain an office aesthetic, while adding in premium gaming comfort and features. This gaming chair also comes in a cheaper, non-leather version made from PU fabric, which is going to appeal to those who are on a tighter budget. Plenty of gaming chairs are comfortable – and that includes the X Rocker Vision Pro 2.1 Wireless – but how many of them have speakers and subwoofers built into them as standard? This model from X Rocker carries on the firm's unique ergonomic design, which is perfect for gamers with back conditions who want to relax without risking prolonged discomfort. You get two Surround Sound speakers as standard, along with a subwoofer for extra bassy feedback mid-battle/race. It's also compatible with almost any console or smart device (including your iPhone), so it's versatile beyond your home console and definitely one of the best gaming chairs of 2019. Designed to emulate the look and feel of a professional racing driver's seat, the DXRacer Drifting Series range marries comfortable cushions for the back, head and neck while giving you decent lumbar support regardless of how the chair is angled – and that is pretty useful considering it comes with eight different positions between 90 and 135 degrees. This model comes in a fetching blue and black finish, and with a variety of comfy foam cushions in everything from the arm rests to the head rest, so you'll be able to avoid a nasty lower back whether you're playing for 10 minutes or six hours. One of the most striking gaming chairs on the list, the SL4000 from Vertagear comes in a white and black design that makes you feel like you're in a space ship. It may look like it's got a leather layer, put it's PU leather, which is one of the reasons it’s a little more affordable than other options on our best gaming chairs 2019 list. It's a model that's comfortable for long periods of time, and every element is adjustable to suit your needs. As the name Titan would suggest, this is Secretlab’s bigger gaming chair for those who need a bit more width and height from their gaming throne. It has a soft and flexible PU leather outer layer with cold-cure foam cushioning underneath. Combine that with 4D adjustable armrests and different recline options and you’ve got one comfy chair that you can fine-tune just for you. What arguably sets the Secretlab Titan apart from the rest of the best gaming chairs in this 2019 guide is an integrated lumbar support that you can control with a knob on the backrest. One of the newest and most ambitious gaming chairs on the list, the X Comfort Air gaming chair from Thermaltake comes with its on built-in cooling system. The result? A 3-fan controller that allows gamers to change the temperature of their chair as they play. As you'd expect from a maker with serious gaming chair heritage, the cooling system is built into a great-looking racing car seat-style chair with adjustable armrests, mould shaping foam and an enhanced steel framework underneath it all. Nice. Small and sweet, the Arozzi Verona Junior is a great choice for the younger gamer or anyone who's under 5 feet 2 or so – if most gaming chairs leave you swimming in too much room, give this a go. The Arozzi Verona Junior has got style and panache to spare, but doesn't go overboard, and is available in black, red, white and blue. Despite the small size, it's got the ergonomic nous of much bigger chairs. With a weight of 40 lbs and a recline angle of 165 degrees, it's ready to fit into any gaming setup. It's easy to assemble too, and comes with back and neck pillows that are perfectly placed to support you. Corsair has been a force to be reckoned with in the world of PC components and peripherals, and it's brought that same sense of premium, high-end quality to its new gaming chair models. The T2 Road Warrior might be name-dropping two famous sci-fi films in its name, but this plush furniture is far from fictional. Ergonomically designed with cushions in every conceivable place, you get everything from 4D armrests (which can move in any direction) to a solid steel skeleton for a robust spine that won’t break or shift. It also comes with a princely price tag, but with these many luxury features, it’s not hard to see why. Songmics might be one of the lesser-known names in the world of gaming furniture, but that hasn't stopped it from putting together the kind of models that offer mid-range looks at a low-end price. Available in a wide range of colours and designs (including the surprisingly attractive camo design above), the Songmics RCG47BGUK delivers adjustable lumbar cushion and all the tilting options you could possibly hope for. The build quality does reflect the price, and especially when compared to some of the more established and costly manufacturers on this list, but considering its price tag is under £120 there's plenty of long-term comfort and value to be found in this brilliant at the basics gaming chair. When it comes to choosing the best gaming chair of 2019, you need to be sure you're getting the right balance between function and comfort. It needs to have the kind of build quality that lasts, but not a price that'll send you into debt. The Secretlab Omega ticks all of these boxes, and more. The memory foam in the lumbar and head supports help make long gaming or streaming sessions a comfortable experience, while the tilt mechanism ensures this comfortable leather throne moves with as you shift in its seat. Considering its quality, getting this for less than £300 is an absolute steal. Office and gaming chairs are big business these days, and that means manufacturers are utilising a variety of materials in their quest to create the most comfortable and versatile seat. The Respawn-300 doesn't go down the opulent finish of leather, or the extra comfort of foam – instead, it opts for a more breathable mesh. The classic racing seat design is still there, with the high-end mesh material creating a light and airy design that's perfect for those streaming and gaming in warmer and more humid climates. The only real caveat is it's a very simple and spartan affair, so don't expect too much in terms of extra frills.